I started producing these radars – god, on Monday? This week feels like a year. As mentioned in the initial post, they are something I’ve wanted to do for months, but I didn’t have the data collected yet or the skill to do them. The skill element of these is still in question, but I have gathered a fairly comfortable data set from 09-10 from the many public sources out there. One of the things that occurred to me while building the base template was that these would likely be much more useful for specific positions. 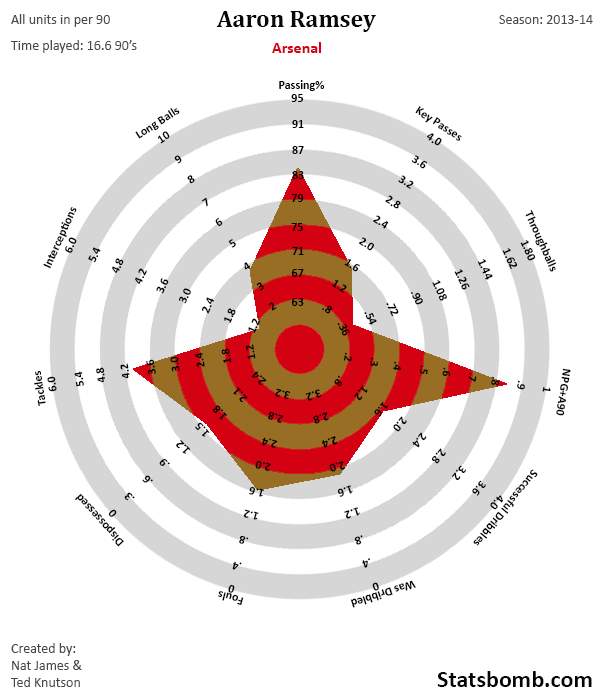 We don’t expect defenders to take 8 shots a game like Ronaldo, and it’s pretty silly to expect Ronaldo to make 5 tackles a game like Arturo Vidal. So that’s what I started doing after publishing the Ballon D’or piece. The first position template I built was for central midfielders. I wanted something that reflected the fact that CMs are potentially the most versatile players on the pitch. They need to attack and defend. Some play a big role in the offense, contributing high levels of key passes, throughballs, some goals, dribbling, etc. Others are destroyers that sit much deeper, and recycle the ball quickly back to offensive players. 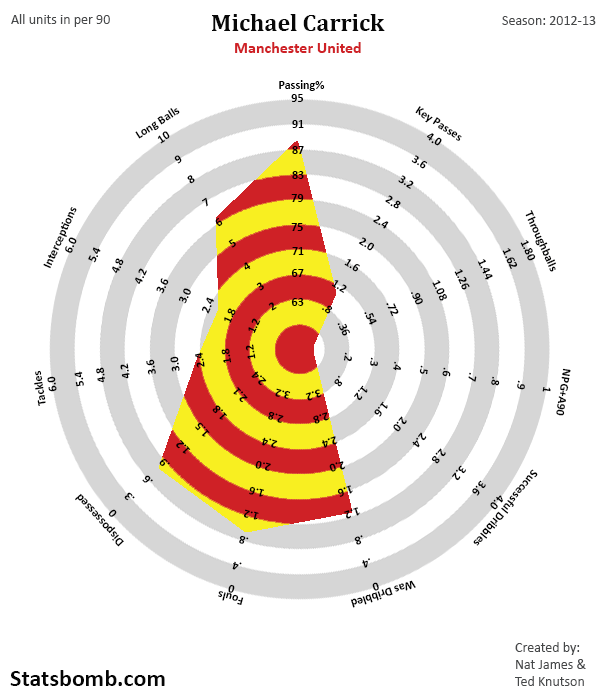 I figured I could create a radar that reflected the full potential of central midfielders. That’s Mikel Arteta from last season. His role is very defensive, with very little area covered on the offensive side of the ball. Now for someone a little different. 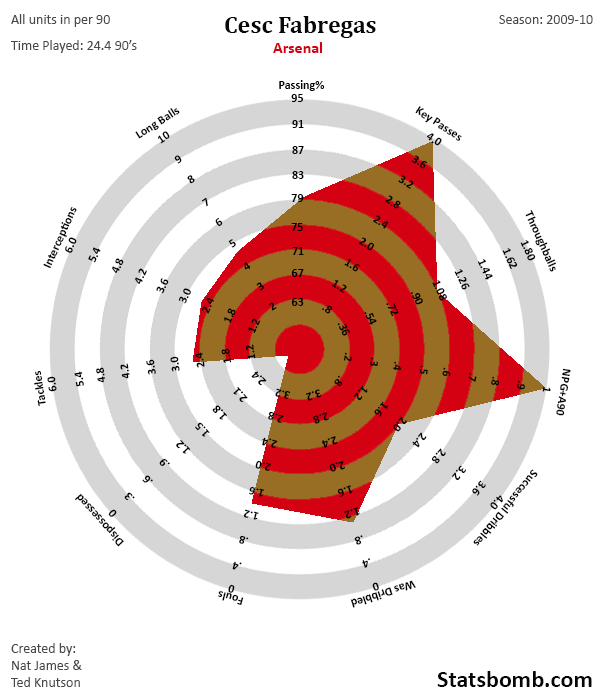 That is Cesc Fabregas at Arsenal in 2009-10. I have stated for quite a while that I think Fabregas is the best attacking passer I have ever seen in the Premier League. Given his key pass and scoring contribution (NPG+A90), that seems pretty accurate. One of the cool things I was hoping to do was use these radars to display how role changes alter statistical outputs. Check this out. 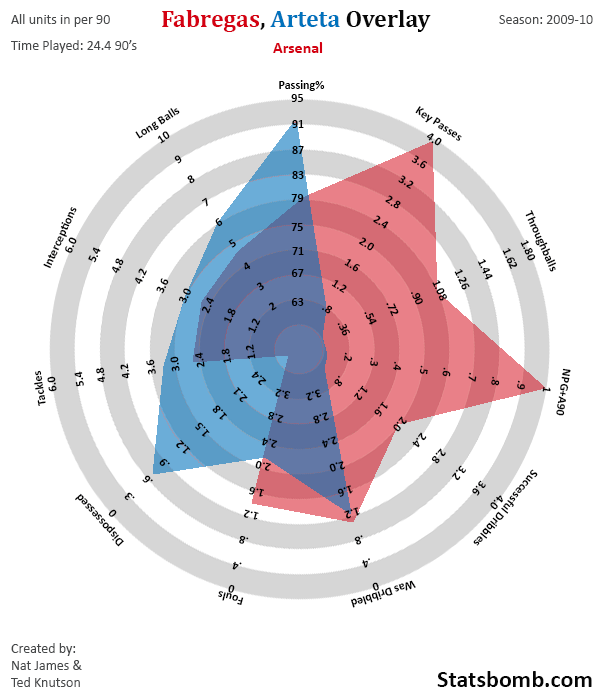 Same chart, two outstanding players, two completely different shapes. Cool, right? Now how about this? 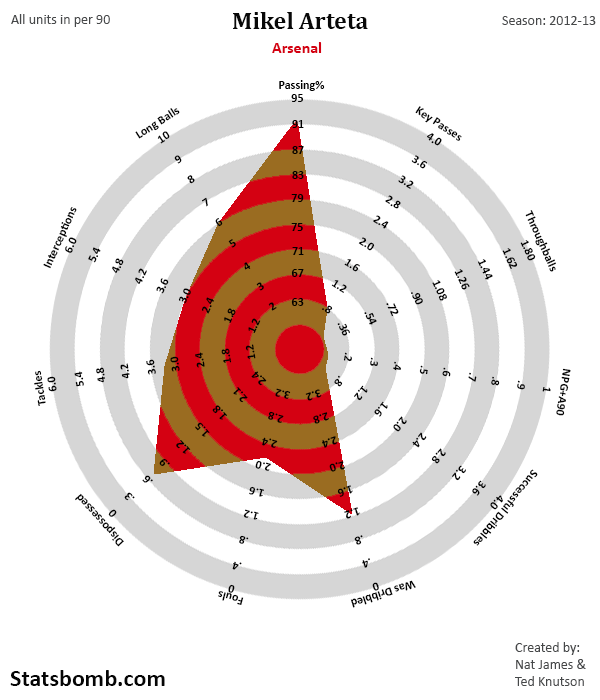 Here’s Aaron Ramsey for Arsenal so far this year (For those reading from the future, the data was good through Jan 17th). 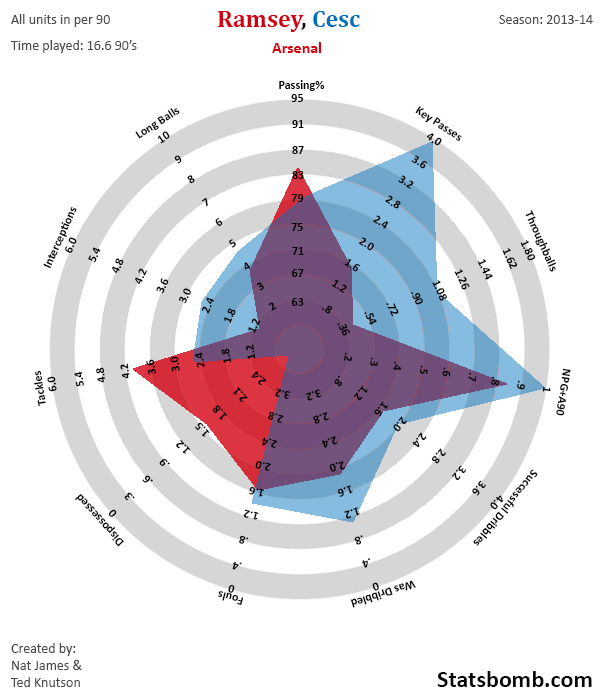 Ramsey probably plays a role much more comparable to what Fabregas played when he was at Arsenal than Arteta, but obviously they aren’t the “same.” They have similar defensive I+T but Cesc intercepted the ball more and Ramsey tackles more. They even have similar scoring contributions (NPG+A90), but Cesc’s were split pretty evenly across assists and goals, while Rambo has scored a ton this year. Fabregas is the more creative passer by far. Now let’s see what happens when we overlay these two. I’m going to keep developing the positional radars based on KPIs I’ve examined and think are important, some of which will obviously get adjusted after feedback. Some of the contextual ones like Dispossessed, Fouls, Was Dribbled make people shrug, but they are actually fairly important bits of information when evaluating midfielders. Other positions will have different axes, and presumably different contextual stats to go along with them. If you like these – and response from most people has been very positive – then check back more in the coming weeks for new positions and comparisons. I’m still very much learning with these, but one thing I am hoping to look at is what happens when you overlay entire midfields on top of each other and then compare them across teams. Though I am new to creating these, I have been studying this for a while and am aware of many of the pitfalls for both the data itself, and then method of display. The boundary choices for each axis are the actual boundaries that a player has produced in that position for the data set. 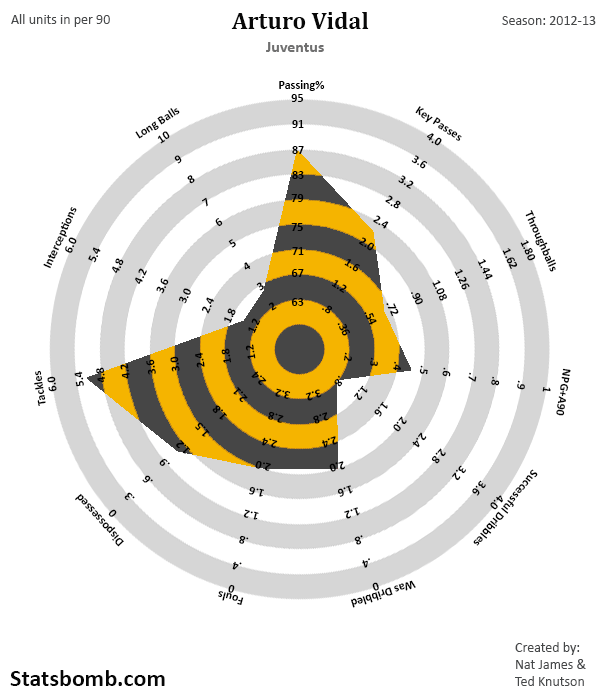 So in today’s case, a player has actually produced those numbers playing as a midfielder across a reasonable chunk of one season. I have grouped similar attributes together. Passing accuracy is neutral, but tied to the passing stats. Long balls are attached to it, but lie near the defensive metrics as well (typically defenders play many more long passes than offensive-focused playrs). Scoring and offensive metrics are to the right of the chart, while contextual metrics are down at the bottom. Defense is to the left. Thinking about it, Dispossessed should likely be next to Successful Dribbles. I will change that in a future version. Good performance should take up more area, so the “bad” contextual stats have had their scales reversed. If a player was never dispossessed, they would hit the outside of the chart. Never dribbled past? The same. Basically, players with the best stats should cover the greatest area in the radar.